This foldable includes 6 different example problems with room for an illustration and an algebraic solution. Multiplying decimals word problem foldable. Great for exit tickets or bell ringers. Print on colored paper to make it fun! Answer key included. Pythagorean theorem word problem foldable has three word problems that are great for bell ringers, exit tickets, to give students a chance to apply their knowledge and practice. Answer key and foldable directions included. This foldable can be used as notes to introduce coin word problems to the students. This is a refreshing way for students to take notes. 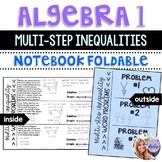 This foldable is part of my Algebra 1 Interactive Math Notebook. This foldable comes with a detailed answer key. 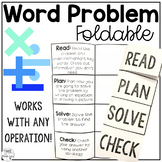 This foldable is great for solving math word problems. It is an acronym that helps students annotate a word problem to determine the essential information. 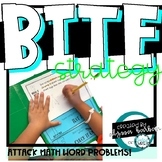 Our middle school students use this with Tax, Tip, and Discount word problems and we have seen amazing results!